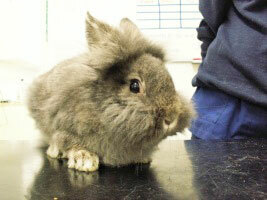 The popularity of the pet rabbit is continuing to increase, as is the amount of diagnostic work that is being carried out for them. Here is a quick guide to rabbit urinalysis to help you out in practice. 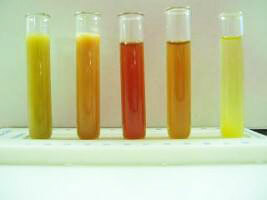 Rabbits are herbivores and thus the urine is normally alkaline (pH 8-9) and turbid. Copius amounts are produced due to their inability to concentrate as well as other animals and daily volumes range from 20-350 ml/kg averaging about 130 ml/kg. The specific gravity varies significantly due to the presence of mineral deposits but should range between 1.003 and 1036, average 1.015. Traces of glucose and protein may be present. Obtaining a urine sample can be done by free catch, manual expression of the urinary bladder (care has to be taken when there is a lot of sludge in the bladder in order not to rupture the wall), catheterisation or cystocentesis. Normal rabbit urine varies in colour from yellow to orange, brown or red depending on nutrition and hydration status and may be influenced by medication. True hematuria may be caused by urolithiasis and cystitis as well as renal disease. The blood is usually uniformly distributed throughout the urine. The dipstick should be able to differentiate but it is always best backed up by sediment analysis. “Pseudohematuria” occurs where blood originates from the uterus in cases of uterine disorders. This can be differentiated from discolouration and hematuria as the blood is usually pushed out at the end of urination. Juvenile, pregnant or lactating animals often produce clear urine. White “Sludgy Urine” or calciuria is voided with excess dietary calcium and sometimes due to urinary tract infection and can lead to calculi formation. Extreme hypercalcinuria often creates problems when passing urine. Imaging techniques can be used to differentiate between sludge, which presents itself with a uniform radiodensity, and urolithiasis. The problem may be managed by diet adaptation and medical support when detected early but sometimes surgery remains the only option. Secondary development of cystitis and dermatitis, especially around the perineum and hind legs, is frequently observed in conjunction with this condition. Antibiotic treatment should follow sensitivity results wherever possible. When repeated straining does not produce any urine, consider a complete blockage and treat as an emergency. Catheterisation can be used to remove sludge. This procedure benefits greatly from repeated saline flushes into the bladder and subsequent aspiration of diluted sediment but should only be performed on the anaesthetised rabbit. Any invasive procedure should be backed up by analgesic treatment. A rabbit in pain will not perform and eat adequately and will most likely develop secondary problems such as gut stasis and hepatic lipidosis. Cystic calculi or uroliths can be seen at any age and regardless of breed. Most are composed of mainly calcium carbonate and predisposed by a diet rich in calcium. They are frequently accompanied by nephrolithiasis. Clinical history often includes previous episodes of sludgy urine. On top of that the water intake of many rabbits is suboptimal due to a variety of reasons such as limited availability of clean fresh water. Rabbits are often kept in small cages with no or little opportunity to exercise and this has also been claimed to be a predisposing factor. Uroliths have to be removed surgically as diet changes and medication will not dissolve them. Failure to do so usually results in the formation of even bigger stones, possible displacement in the urethra and complete blockage. The latter should be considered an emergency. Nephroliths can also be taken out surgically after assessing kidney function by blood chemistry and imaging techniques. Renal failure will develop if they are not removed. If you have any interesting or challenging cases that you would like help with when considering your diagnostic approach please do not hesitate to contact our veterinary surgeons on 01483 797707.